The point of competition has changed once again in the Adventure segment. First it was farkles like extra lights or moveable windscreens. Then it was the power. Now, top tier ADV bikes must have a slew of electronic aids to keep Ewan “I only ride with a full support crew” McGregor and every other goofball upright during their expansive travels. 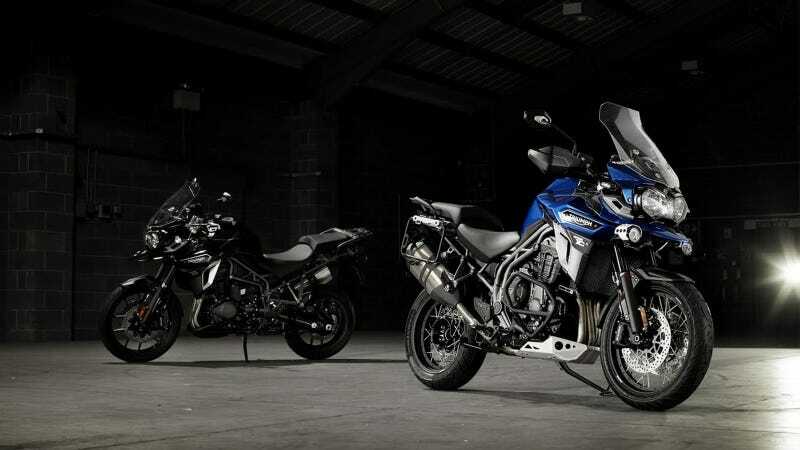 The 2016 Triumph Explorer is the latest entry in this new super-adv class. Hold onto your hineys. It’s abbreviation onslaught time. Just know this, the XR’s are the road going versions with cast wheels and road biased tuning, the XC’s are the offroad biased ones. All six models get a heavily revised 1,215 cc triple engine and shaft drive, which Triumph says has “more power,” and a clutch with a lighter pull. The XCx, XCa, XRx and XRt benefit from new, 5 mode, electronics which include semi-active suspension, and ABS and traction control that work in tandem with an onboard computer to be more usable through corners. The system should work bang on identical to the KTM version since Bosch does everybody’s units. Tuning will probably be slightly different, but the mechanisms the same. The new electronics also have a hill hold feature that should save quite a bit of blushing at the next Klim get together. The base XC and XR go without the new electronics, but do have ABS and adjustable WP suspension. These are competent add-ons for a large heavy, motorcycle that few will take offroad, but the extra safety and aids are just another step to make these super-adv bikes more exploitable on the road.